I recently had the chance to test a few new LED Video lights. The new BladeLight from FloLight is not your common square LED panel that often works through an array of small (fixed lens) LED bulbs. 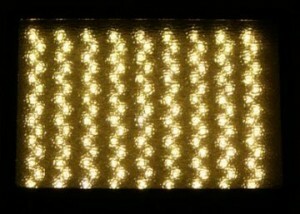 The BladeLight uses high power COB LEDs packed densely into a single long linear (single) strip. Without any lenses over these COB LEDs, the BladeLight throws at a wide 120 degree beam covering a very broad area in just a short distance. 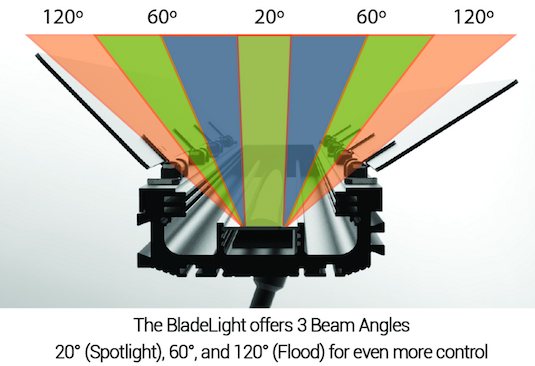 But just in case you wanted your light to throw further or narrow the beam, there is a lens that can be added over the strip of LEDs to focus it to a narrow 60 or even 20 degree beam while feathering out at the edges. Here's a video overview of an early set I was able to test from the FloLight company. If you're a fan of the efficiency and durability of LED lighting, but missed the long wide soft spread of CFL (kino-ish) Panel lights, these new BladeLights could be something to keep in your radar. The option to add a lens is probably what makes this light most unique along with very functional barndoors to cut (flag) the light for even more creative control. They will also be available in Full Daylight, Full Tungsten, Green LED (to enhance Green Screen use), and eventually a Bi-Color version. Right now the BladeLights come in an 18" and 36" inch model, but the all Aluminum housing is robust enough so that several lights can be stacked together either horizontally or vertically if you needed it to be longer or larger. 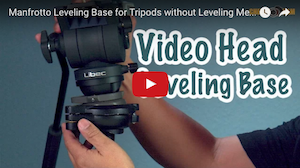 The housing allows you to add the focus lens, or a few filters to modify color or diffusion. 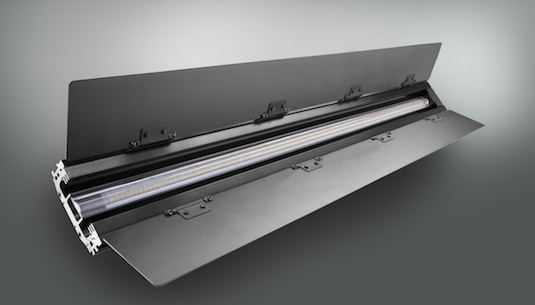 With the high power LEDs, you can still clip an additional diffusion sheet to the barn doors to soften the light and to create a larger light source without sacrificing too much output. (TIP: wax paper or parchment paper used for baking are inexpensive, can be found at any grocery store, and work well for diffusing light in a pinch). Keep in mind the lights i've tested may be a slightly earlier model but should be close to the final production version. They final models are available now and so for the most updated information and availability about the new FloLight Bladelight, visit the product page (found here). Posted in dslr video. Tags: Bi-Color, cob led light, daylight, FloLight Bladelight, flolights, green screen led video light, High power led video light, tungsten on February 16, 2016 by Emm. 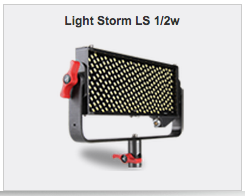 Earlier this year at NAB 2015, Aputure introduced a new series of LED Video lights called 'Light Storm'. 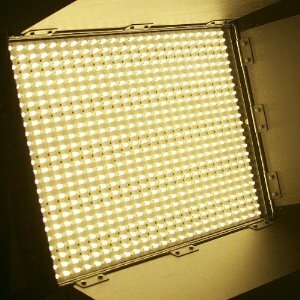 The Light Storm LED Panels have a dense array of High CRI LED bulbs. 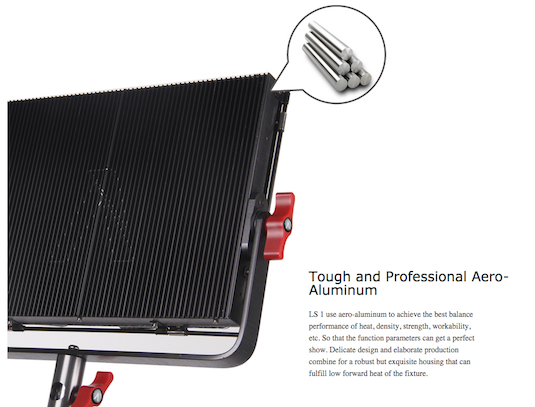 By eliminating all of the controls to a separate box, the Light Storm LED Panel itself is designed as a giant heat sink to dissipate heat. 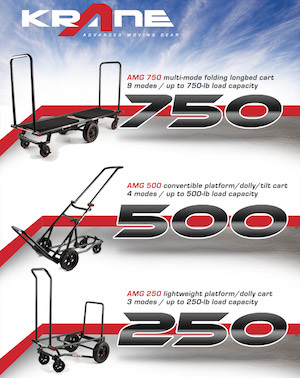 The other benefits of this design are that the main panel remains slim and lightweight so that you don't have to use heavy stands. 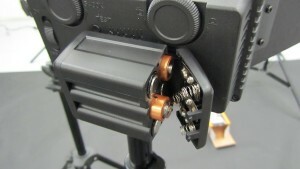 The separate controller box of the Light Storm LED lights holds a battery mount (v-mount or gold) and with this weight hung low on the stand, you can eliminate the use of sand bags. 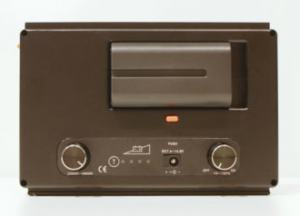 The controller box also houses the DMX controls, Wireless controls, and power (dimming) options. The system can also be powered via AC wall adapter. 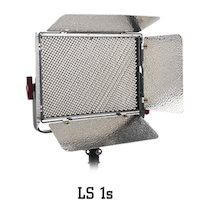 There is a Full Panel 'LS1' and Half Panel '1/2w' in the Light Storm series with each available in Single Color (Daylight) or Color Temp Adjustable (Bi-Color). 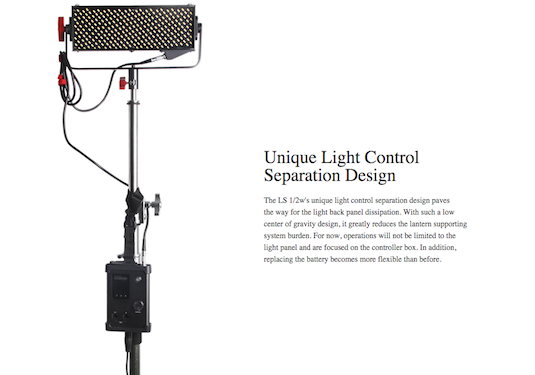 The LS1 is said to output equivalent to a 1K light, while the 1/2w (half panel) is equivalent to a standard 500w light. 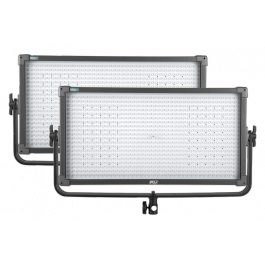 The full size Aputure Light Storm Panel LS1 provides the strongest output packing 1536 LED bulbs, but has a narrower pattern compared to the 1/2w. The 1/2w can throw a very wide beam and is built using SMD (surface mount) LED bulbs. The Aputure Light Storm LED Panels were first introduced back in April, but they are finally available to purchase right now. 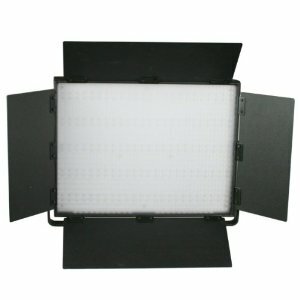 You can find the new Aputure Light Storm LED Panels starting at under $500 and up (available here). Posted in dslr video. Tags: 1k led light, 500w led video light, aputure 1/2w light storm light, Aputure light storm led lights, aputure ls1c, aputure ls1s, Aputure New Powerful and Slim Light Storm Series LED Video Lighting, Aputure Video Light, Bi-Color, color temp adjustable, gold mount adapter, v-mount led light on July 20, 2015 by Emm. 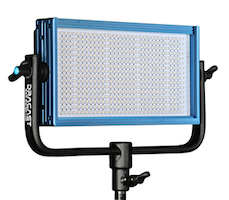 NAB 2015, John from Dracast breaks down the new PLUS series of Dracast LED Panels. 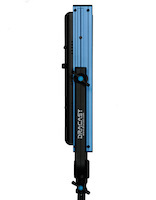 The Dracast PLUS panels come standard in Aluminum Chassis for durability and carry a 93-95 CRI Rating. A new full readout digital display upgrades the user interface, and new electronics have been added for Smoother step-less dimming. 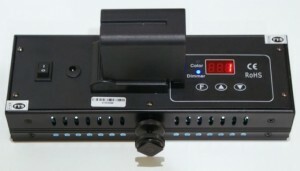 DMX Controls are now standard and can be used with Various battery power solutions (v-mount, gold mount). Optional modifiers can be added such as Barndoors, Chimera, etc. 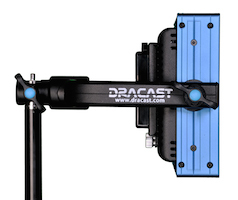 For more information about Dracast PLUS Series LED Video Lights, check out their website at Dracast.com (here). Posted in dslr video. Tags: Bi-Color, digital display led panel, dimmable, dracast dmx, Dracast LED Lighting, dracast plus series led video lights, high cri on May 21, 2015 by Emm. 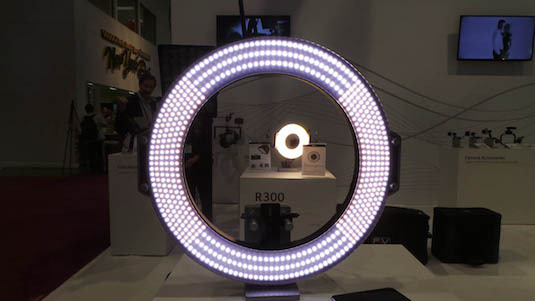 In my opinion, one of the most popular LED Ring lights available today is the F&V R300 (seen here). 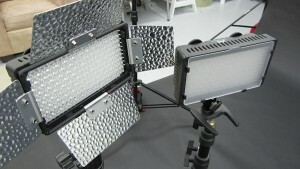 Obviously ring lights can provide a unique aesthetic for catch lights, but the R300's were so powerful they can also be used to replace standard 1x1 light panels. They've even offered a softbox for the R300 to suppress spill and add more creative control over. 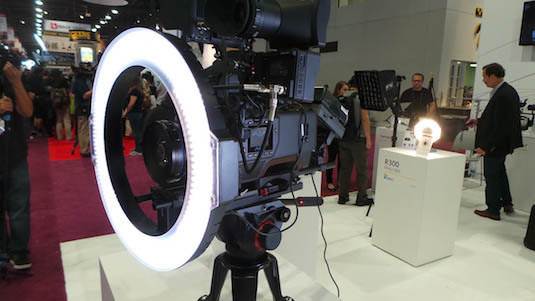 At NAB 2015, F&V introduced a new larger Z720 LED Ring Light. The larger diameter means the Z720 will work with larger cinema lenses, offer a wider spread, more power output, and provide more of that unique 'ring light' quality even at a distance. The Z720 can still be battery powered, is dimmable by quadrants, color temp adjustable, and can even be controlled wirelessly through an application from a smart device. Perfect when managing several lights simultaneously. 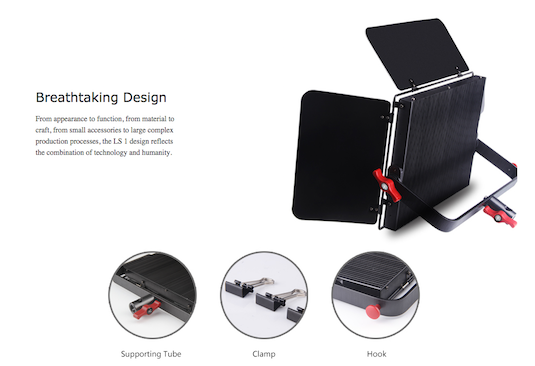 The Z720 LED Ring light can also be used in an optional softbox operating as a basic LED Light panel. 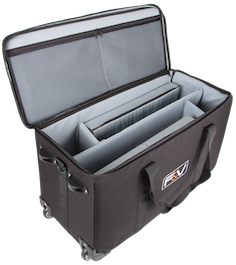 With the popularity of the softbox accessory for the R300, F&V has also designed one for their top selling K4000 panels. The new Wifi module seen from the Z720 can also be added to the K4000 panels, and for those wanting a larger light source, F&V offers 2x1 wide led panel options. 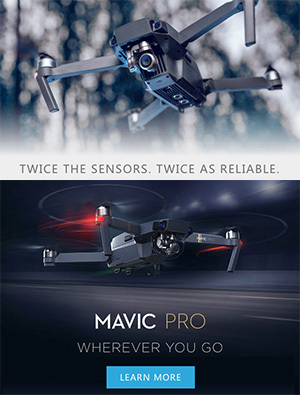 Take a look at the NAB 2015 booth coverage video below. Posted in dslr video. 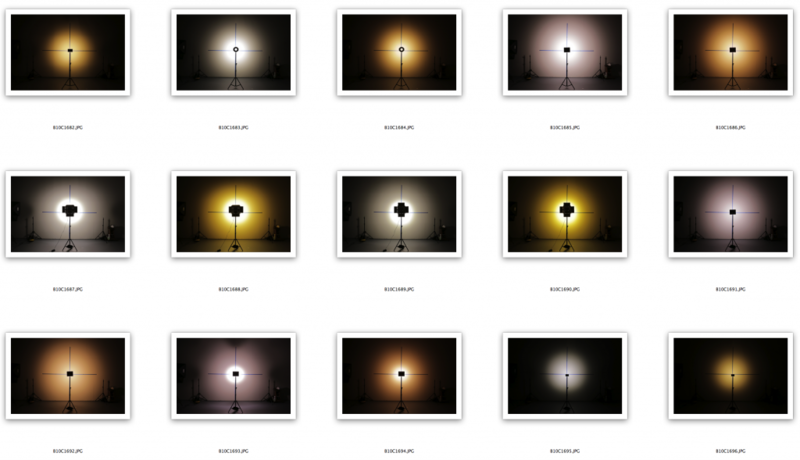 Tags: best led ring light, Bi-Color, F&V led ring light, fvlight ring light, LED ring light, NAB 2015, Wireless LED Light, z720 led ring light review on May 14, 2015 by Emm. Remember a short while back I mentioned I was working on a personal project to perform some independent LED Video Light Tests? Well here's a small update on where this project is at. The image below (computer screen shot) are various different LED video lights I have laying around shot with exactly the same settings. This is a visual reference to compare the brightness, spread (diffusion), and also color reference of each LED video light. I've locked the camera down to a white balance of 5600K for these images. Some of the tests were performed between Daylight and Tungsten, but the side by side comparison really shows extreme color casts between the various LED lights. I also decided to get more serious about using a true LED Spectrometer for these tests that will provide me with more accurate readings and charts. I'll be able to share these images as well as exact numbers from the meter for each light including CRI and LUX readings. 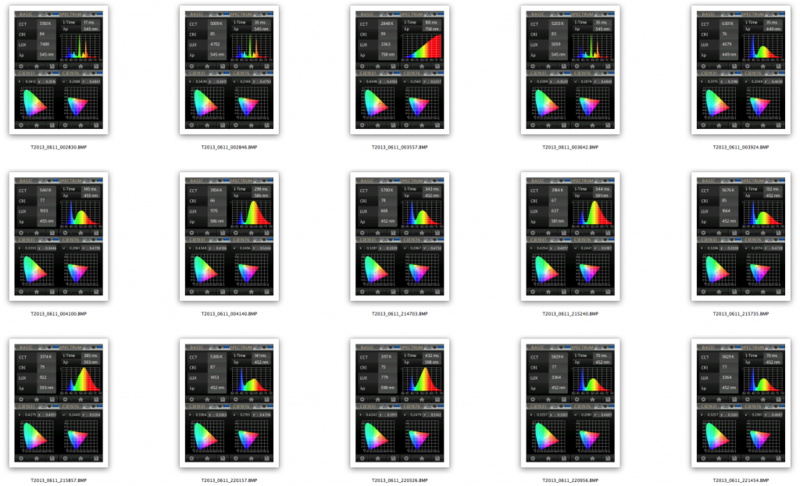 The image below are a few settings from the various LED Video lights. This project will be quite interesting indeed..
[Note:] I am performing my own tests with a standardized setup across each LED light as a reference. This is an independent test which may greatly differ from what each Manfacturer displays as their proper listed technical specifications. 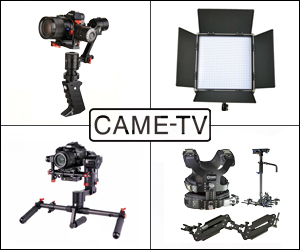 Posted in dslr video, Equipment Reviews, LED video lights, Lighting. Tags: 240, 312, 508, AL528 LED, aputure, Bi-Color, Cheesycam, CN-600, CN900, CRI, Daylight Tungsten, F&V, FotoDiox, R-300, Spectrometer, Video Lights, z96 on June 12, 2013 by Emm. This new 209 LED video light is the smaller version of the popular 312 LED video light, but slightly larger than the smallest 144 Bi-Color LED Video Light . It's definitely a welcome size for those who feel the 144 too small and the 312 too big. In fact I ended up purchasing several of the 240 Bi-Color LED lights because I wanted that size and the color adjustable feature. This new 209 LED light comes in just a bit higher than the 240, but it does have some additional features the 240 lacks. 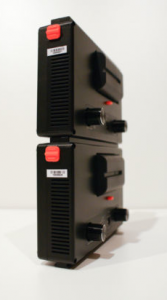 One popular feature that resembles the Z96 is it's stacking form factor. A few of these panels can build up into a nice larger light source. The second feature is a DC input, which means you can run a variety of external sources and power up for longer run times. You can find the 209 Bi-Color LED Video lights via eBay (found here). 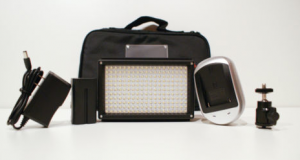 Posted in Equipment Reviews, LED video lights. 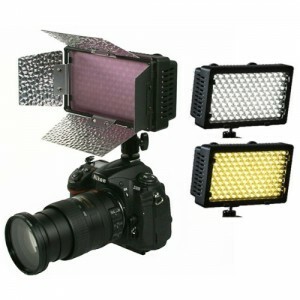 Tags: 209 led light, bi color changing led, Bi-Color, dslr LED, LED Video light on September 12, 2011 by Emm. 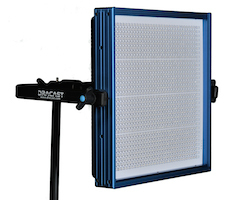 The latest 1200 LED light panel is now being offered in a Color changing model. An added dimmer knob allows the LED panel to switch and mix between two different sets of LED colored bulbs giving you a range between 3200K-5600K. Unfortunately like the other 1200 LED panel, it still does not have the V-Mount adapter to use this off the grid like the smaller 600 or 900. 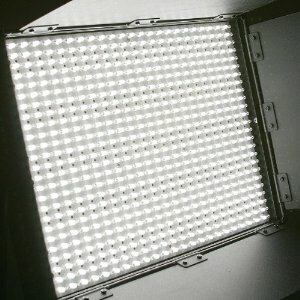 Something to keep in mind - since the 1200 panel uses two different rows of LED lights, when switching from one color over to the other, you'll be cutting the LED count down to half (600 tungsten LEDs and 600 Daylight LEDs). The question you're all thinking about - why not just use Gels? First, Gels cut down light quite a bit, and it's also one more thing to carry. 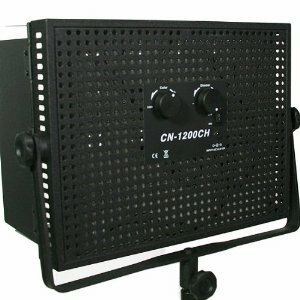 Using a Bi-Color LED light like this 1200 can also mix in between temperatures. If color changing on the fly is an important part of your work flow, you might want to look into these below. 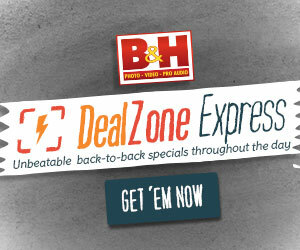 Posted in 1000 LED, Equipment Reviews, LED video lights, Photography Gadgets, Videography Gadgets. 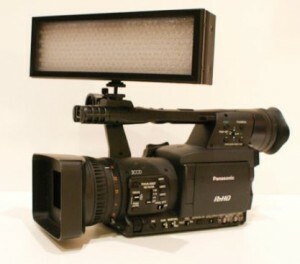 Tags: 1200 LED, Bi-Color, color changing, DSLR video light on June 2, 2011 by Emm. Not sure how many people remember the 240 Bi-Color Dimmable LED Video light I posted about a short while back. It was a mysterious 240 LED light that showed up on eBay, and the moment I posted about it, it disappeared. Never to be heard from again. Well these 240 LED lights are back online , and now with some new options. My original 240 LED light from eBay did not come with a way to power it up. Luckily I had the correct Sony battery and charger from another set of lights. This was a huge deal breaker for some that didn't use Sony batteries in their work flow. 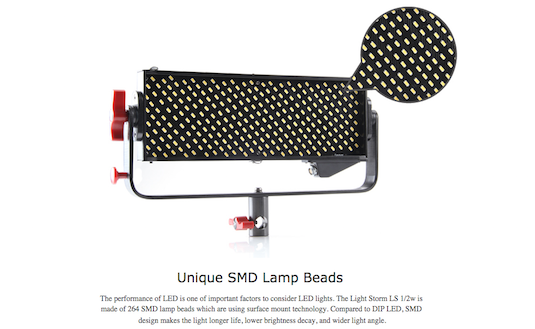 This time the 240 LED light comes with or or without barndoors ($6 dollars cheaper without). They come standard with a Magenta (minus green) filter and a metal hotshoe ball mount. 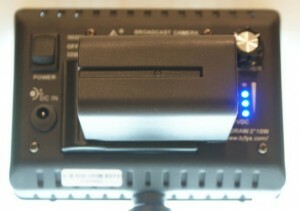 You can power the 240 LED light with a single Sony NPF style battery, or a Panasonic with an included adapter. One thing that grabbed my attention was a very very cool AA battery adapter case that turns 6 AA batteries into a Sony NPF style battery. Deal breaker no more! I've never posted such an adapter thing on this blog, but damn I sure did need something like this! 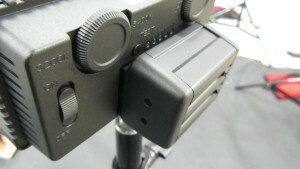 A battery case like this can be used to power any other NPF accessory like some external monitors, the 277, the 312 LED, and more. To my knowledge (and i've seen quite a bit), these are the cheapest color changing LED video lights today. As usual, it's on the blog today, we'll see how long they last..
Posted in LED video lights, Videography Gadgets. 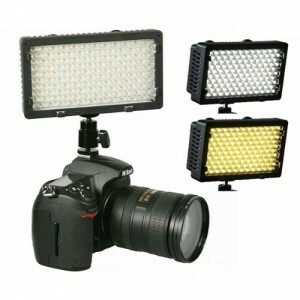 Tags: 240 LED, Bi-Color, color changing, DSLR video light, Sony AA adapter on May 26, 2011 by Emm. Well here's another article that will probably get quickly outdated. Remember those 240 LED Bi-Color (Color Changing) on camera LED lights from here: http://cheesycam.com/color-changing-dimmable-240-led-video-light/? Well, I was lucky to grab a set and then they were gone, never to be seen again. Apparently there might be some type of exclusive distribution that won't allow them to be sold on eBay, but if you really really wanted them, you can find them for almost twice the price at some retail locations. So for on camera lighting that adjusts to the ambient, you've got a choice on the 312 Bi-Color LED lights which 'totally rock' BTW (I have a set and will do a video tomorrow), but those are still running about $230-$499. Here's an interesting one that just showed up and comes in a bit cheaper with 277 LEDs from maker Socanland with the same color changing features and powered by what looks like Sony style batteries. States only two available at this time, so this could be one of those times it's here today and gone tomorrow. Apparently Socanland was at NAB and are manufacturers of other large LED video lights. The only video I could find about this company is the one below on some larger 1x1 sized light panels. So for now, only a few of these smaller 277 Bi-Color Changing Dimmable LED Video lights from Socanland are available along with a 310 Bi-Color version. Personally the 310 version looks overkill on the whole digital display and I feel it's overpriced. You would be better off with the 312 Dimmable Bi-Color LEDs if you wanted to go that big. Not sure how long this company has been around, but it looks like in the near future we could be seeing a line of Socanland products competing in the LED Video light market. Posted in LED video lights, Lighting, Photography Gadgets, Videography Gadgets. 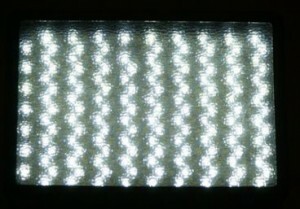 Tags: 277 Socanland, 377 LED, Bi-Color, color changing, dimmable, LED video lights on April 17, 2011 by Emm.